Every now and again, we don't have a plan. Sometimes we just pick a direction and drive, hoping that we eventually find a pub that sells food. Placing your fate in the hands of the pub Gods can be a risky business, but it can also prove ultimately rewarding. Both cases were summoned in to reality this week as we headed in to the unknown, so settle down and jump on board our latest adventure in to Pubington. We turned right, then went forward, then turned right again, I can't remember the rest of our directions. But at some point we ended up heading for Midhurst. 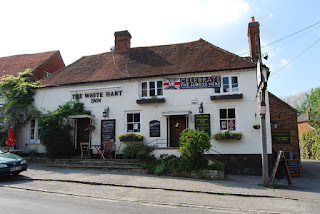 The first pub we found that we hadn't already visited, was The White Horse, A stunning bit of poetry, considering we reviewed a different White Horse last week. We parked up, strolled in and stood at the bar, where we were ignored for ten minutes. Eventually we were acknowledged and offered drinks. After ordering, we asked about food, and were told uncertainly that there was no food today, something about a wedding. We promptly cancelled the drinks and leged it. A memory string was twanged in Dad's mind as we passed a sign for Harting. 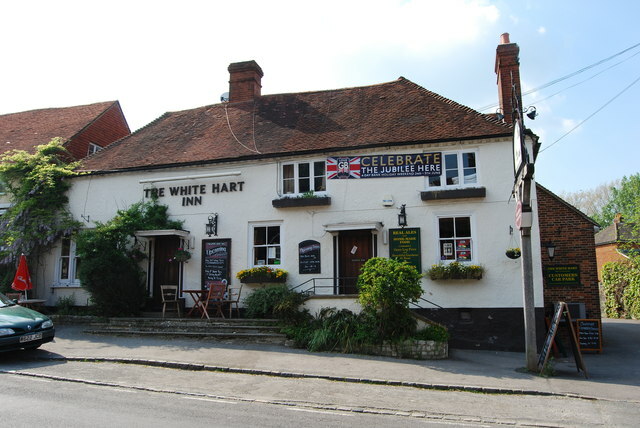 We promptly followed the sign and found ourselves at The White Hart in South Harting. Upon entering, we could instantly feel that mysterious pub magic in the air. A friendly welcome, oak beams, a slightly worn parquet floor and that smell which is particular to the finest of English pubs. We took a table by the fireplace, which unfortunately wasn't lit, although we did have a candle on the table which was. We, especially me, got very excited as we ploughed through the menu. Great variety, fair prices and a clear eye for imaginative details set this menu a class above the norm. I even made the bold statement, that this may be the best menu we've ever seen. The cherry on the top was the lunchtime set menu, offering two courses for £15 or three for £18. This is the direction that we decided to take. Dad chose, smoked ham hock and black pudding terrine with piccalilli, pork crackling and bread. For his main, beef and horseradish sausages, mustard mash, onion gravy and crispy leeks. You can see already how we were excited about this menu. It shows effort and care, making you want to eat the food. For my part I picked the roasted, curried parsnip soup with lime crème fraiche, parsnip crisps and bread. This would be followed by tempura fried red mullet with noodles in a lime and soy dressing. That is not the sort of food you would usually find on a set lunch menu in a pub. It quickly became clear that our instincts were correct. The food was beautifully presented. The soup was perfect and the parsnip crisps light and delicious. The terrine was wonderful, taken to another level by the piccalilli and crackling. The bread was fresh and the service continued to be just right. By the time the mains arrived, we were already convinced that we had found something special, but the food set before us only served to cement what we already believed. There is a serious chef at work here, who wouldn't be out of place in a fine dining restaurant. My tempura mullet was absolutely perfect and the dressing on the noodles was immense. Dad's was equally as impressive, with the crispy leeks acting as a perfect balance to the creamy mash. Not only were we amazed to find such food on a set menu at such reasonable prices, but we were also pleased to see good portion sizes. Set menu can so often mean less food for less money, but not here. There was quite literally nothing wrong with our food, it was of an incredibly high standard. Thankfully, it was a rare case of finding amazing food in a wonderful pub, thus creating the perfect pub storm. This may even be our new best pub ever, or at least in the top three. 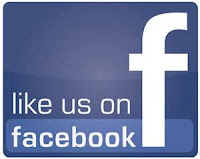 If you haven't been here, we urge you to give it a try, you won't be disappointed.